The German Shepherd Dog is arguably the most versatile breed in the world. It excels as a working dog in many different venues, provides companionship and protection to many families, and competes at the highest level in conformation and performance events. 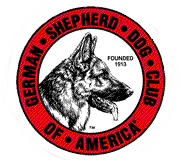 We hope that the content of this site will help you learn more about the breed if you are thinking about adding one to your family, more about your dog if you are already blessed with a German Shepherd, or more about how you can participate in the many events and activities that the German Shepherd Dog Club of America makes available to you.